A wigwam picnic is just what the doctor ordered for these two monkeys when the weather had gone to poo. The rain poured down but we still enjoyed ourselves with a little imaginative play and a picnic. The kids got treated to some yummy chicken nuggets and fries which is a novelty in this house so they were overcome with excitement. We love a good picnic in the summer and until we can get back to having them outdoors we will be getting creative with them indoors. It can get boring to sit at the table for breakfast, lunch and dinner all winter long especially for kids. And this year is all about breaking out of my comfort zone with them and making them smile as much as possible. 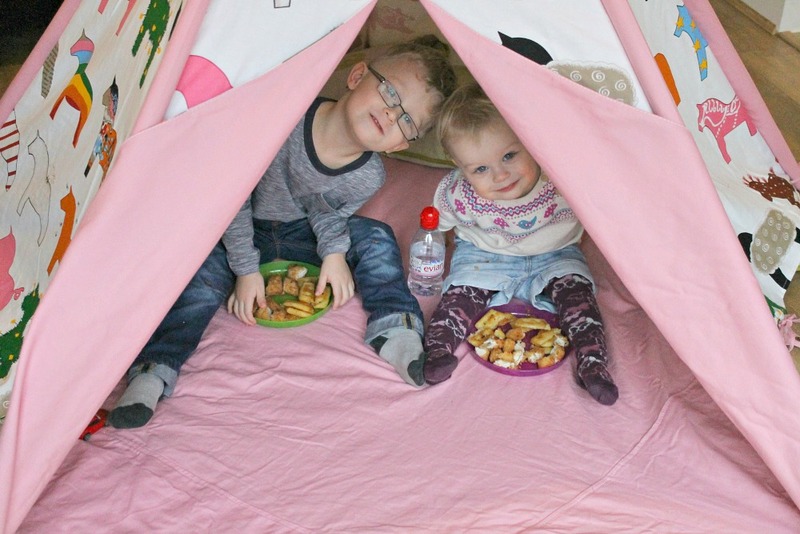 I have loved wigwams for a long time and wanted one for the kids but didn’t have the space little did I know you can just pull the poles straight in to each other in seconds and lean it in the corner to use whenever you want. Or even slide it under the couch until you want to have a picnic or a play. (this is not a review just an opinion about our new wigwam). They are brilliant. It’s about the little moments of laughter and smiles that make life feel so great. With two toddlers on my hands it’s all about playing make believe and being silly too! Let my inner child come out as I want to the fun mommy. So adorable! Wigwam picnics look like the way to go! Yes in this house it’s nice to say it’s wigwam time and they get all excited as I set it up! lol I used to love forts when I was a kid so this is brilliant. We even make it into a big fort with blankets from the tent to the couch for a massive afternoon of play time. Thats an awesome wigwam. We have a huge Thomas play tent that z regularly pretends is a car! That’s awesome. I saw one and was going to get it for Buba but thought this would satisfy both of them. lol As its big enough for both of them and me inside. lol Bet he loves the Thomas one. Buba would for sure. Thank you Aby. They had so much fun in it. I love that little wigwam it’s gorgeous! Thank you. I was hoping for a more chevron or stripey style fabric but the kids begged me for this horsey one. lol It’s their tent so they win. haha Doesn’t really match my decor but sometimes you got to let them win for some fun! They look like they’re enjoying themselves even if they can’t go outdoors for their picnic! Thanks Fiona. I know I really need to go on an adventure outdoors soon. We have been indoors way too long. Thank you. I would have preferred a more subtle one like a striped or chevron one but the kids wanted horsey! lol And it was a gift so they win. They are hilarious in it too. Thank you Kim. They are funny together at the moment. So creative in their playing. Thanks Merlinda. I know I love listening in on the imaginative play that goes on in this house between my two. They are hilarious together. Hello there. 🙂 Tippee Tents are so cute. Thanks Janine. They are fun too! This one even fits us big people so we can get in on the make believe. Thank you Lina. Oh yes they absolutely love a good picnic no matter where it is. We tend to have them all over the house in made up forks and tents until the weather is nicer. Thanks, they are two peas in a pod or in this case two peas in a tent. hahaha They couldn’t get enough of it. I love wigwams. I love the cute horse print. So sorry my host, Bluehost has been down all day. Very frustrating. I really need to change over but not sure how hard it is and if my email will change etc. Thank you so much Alexandra. So sweet of you. I try to keep it fun and silly for the kids. I want them to know they have a fun mommy as much as a routine/strict one. hahaha We love our new tent. I wish I could have got one that matched the decor more but the kids wanted horses! I think I am in love with it too. I go in and hide from all the toy chaos! lol 🙂 The toys seem to stay outside the tent more than inside it! Can’t beat a good wigwam.